Matt Whipkey and his band at Reverb Lounge Feb. 2, 2019. 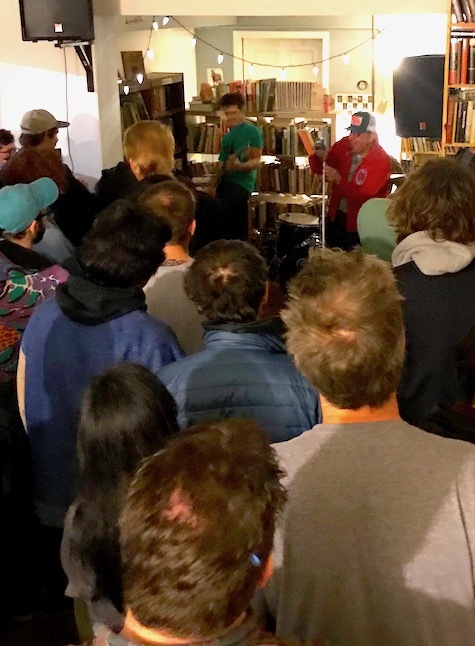 It was a shoulder-to-shoulder crowd at Almost Music Saturday night around 8 p.m., the store filled with revelers celebrating the unfortunate demise of an Omaha music store. Some of the book shelves had been moved out of the Solid Jackson side to make room for the crowds watching the bands. In back they were doling out what can only be described as “doses” of the Nite Owl “punch” that indeed packed one. It was a happy though solemn affair as we were all happy to see the bands and each other, and sad that it was the last day for Almost Music and Solid Jackson, a store that will never be equaled (Unless Brad decides to open one again some day). So crowded was the store that we couldn’t see Pagan Athletes, who were performing on the other side of the room. The synth/drummer duo was knocking out crazy futuristic jams, hyper-kinetic instrumentals that held the crowd in a trance with its jittery swing. The fine young man standing next to me drinking the blood-colored punch from a coffee cup said the band consists of John Wolf’s sons! Wolf is nothing less than an Omaha music legend behind such great bands as Cellophane Ceiling and Bad Luck Charm (among others). No doubt talent runs in the family. Check out some Pagan Athletes demos below. Wagon Blasters at Almost Music’s farewell show, Feb. 2, 2019. Speaking of legends, Pagan Athletes was followed by Wagon Blasters, the next evolutionary step in the ever mutating genre of Nebraska Tractor Punk. Gary Dean Davis was in his usual fine form, as was the rest of the band, who I could barely see while standing atop a three-foot step ladder, where I took the above photo (I never got a clear shot of Pagan Athletes). We only hung around for a couple Blasters songs, overcome by ennui generated by the knowledge that we wouldn’t be able to stop into Almost Music again on Saturdays after lunch at Noli’s. Brad, we salute you (and by the way, you hit the nail squarely on the head with that Rat Columns album — primo!). We headed cross town to catch Matt Whipkey’s set at Reverb Lounge. Whipkey has been performing in a variety of bands and projects for almost two decades, and while rock has always been the staple, his style has varied from Americana to heavy metal (or close to it). That variety makes for a fine selection of songs and styles, which we got a heathy sample of Saturday night.